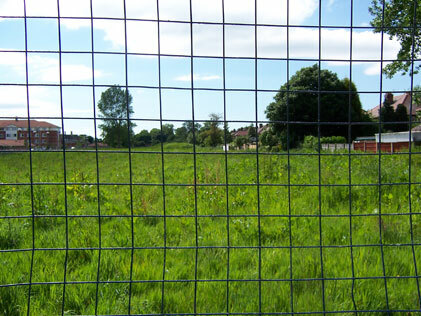 The New Town Development Corporation planned to restructure the whole of Warrington. Part of this plan was a proposal to construct a network of "motorways" through the town. They were actually all-purpose A-roads, but were planned to be dual carriageway and grade-separated so would function much like urban motorways. 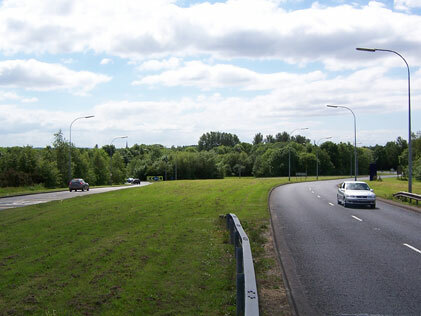 It would have looked very much like Runcorn, another nearby New Town with its own expressway network. Warrington's roads never got built. The sections planned to carve through existing development were never even started and the New Town districts frequently only have open space for the roads to be provided in the future. The only one that can really be said to exist is Birchwood Way. This page explores its route in detail. 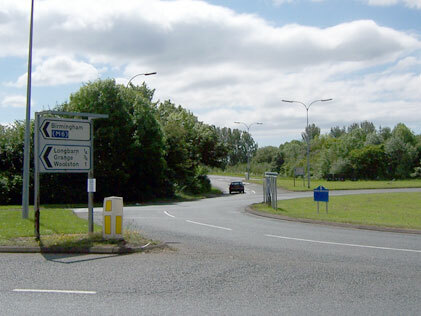 Our tour begins at M62 junction 11, where the A574 (actually a spur of the numbered route, which we join in a couple of miles) is the only exit from the roundabout. This is Birchwood Way. 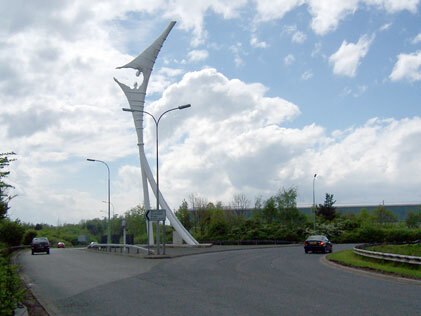 The sculpture is named 'Encounter' and is a typical attempt to give the New Town development some identity through public art (see Skelmersdale for numerous examples of the same thing). All the junctions are almost precisely a mile apart. Halfway to the first, a footbridge crosses the road between Gorse Covert and the industrial estates to the north. From this bridge we can play our first game of "spot the missing carriageway": most of Birchwood Way was only built as single-carriageway with provision for widening. This roundabout at Gorse Covert is the first stop and, unlike all the other junctions, it has no provision for future grade-separation. The only explanation is that it was not thought necessary given that the road would stop a mile further on, but it's a pretty weak excuse. 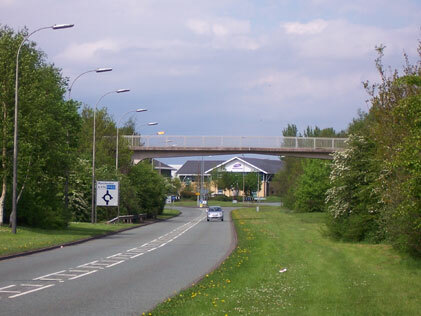 We continue along Birchwood way and, looking back the way we came, this footbridge crosses the road shortly after the roundabout. It's another clue that the road was meant to be much bigger. 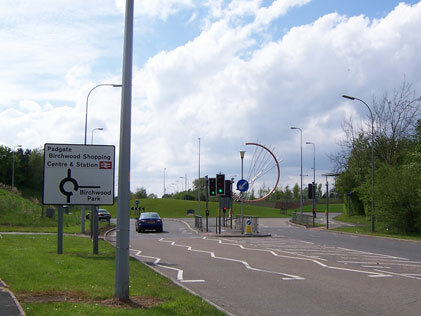 The next roundabout is not part of the New Town development; it was added in the late 1990s (along with these out-of-place traffic lights) to provide a new entrance to Birchwood Park, the enormous business estate just to the north. It has another meaningless sculpture in the middle. Immediately afterwards, the road is dual carriageway and the two halves very quickly split apart. Seen from a footbridge just to the south, this is the junction it's approaching (from the previous photo traffic enters from the right). 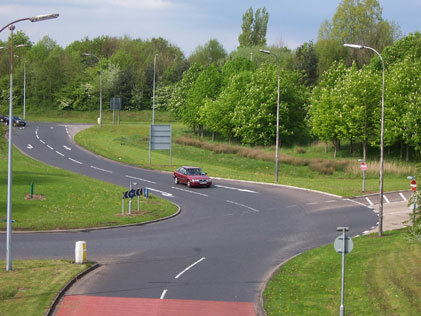 When originally built it had two three-lane roundabouts linked by a dual-carriageway, but more recently the redundant parts of the roundabouts have been filled in to make a single strangely-shaped one. Its unusual shape makes it a local accident blackspot. Burned-off road markings show that at one point, Birchwood Way was given priority, but this experiment clearly didn't work out. 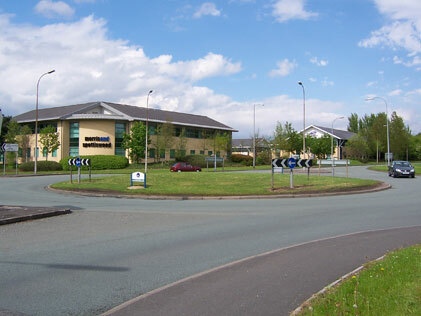 It's a very busy road, despite being mostly single-carriageway, and this junction causes long queues in both directions in the rush hour (actually, Birchwood Way blocks up for its full length in both directions in the rush hour - it carries people commuting into both Manchester and Warrington). 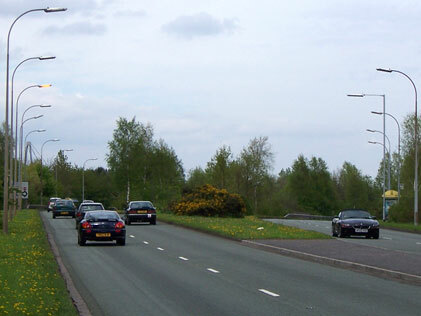 The distance between the carriageways as they meet the dumbbell roundabout is enormous - no shortage of space for a flyover. The eastbound approach to the junction. 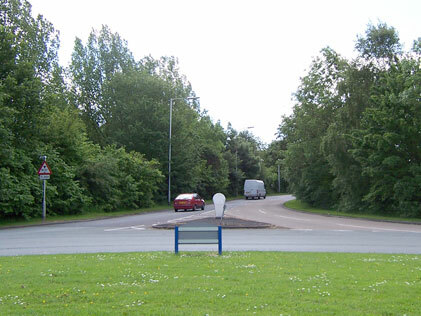 Between here and the next roundabout Birchwood Way is dualled, and there is no shortage of warnings for fast-moving traffic to slow down. The dashed markings nearest the camera are for a bus stop. Looking east at the carriageways beginning to flare out on the west side of the junction. Despite its huge size, the sliproads here might have been quite tight. 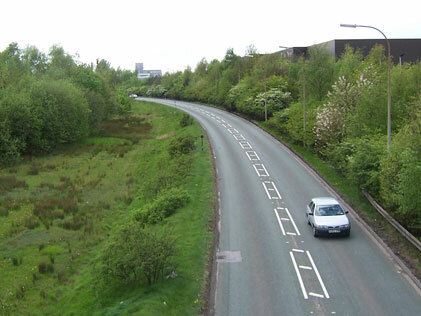 A general view of Birchwood Way west of the dumbbell roundabout - this is the closest thing there is to a finished example of Warrington's expressways. Two lanes, with a broad central reserve, segregated pedestrian paths and a 70mph speed limit. 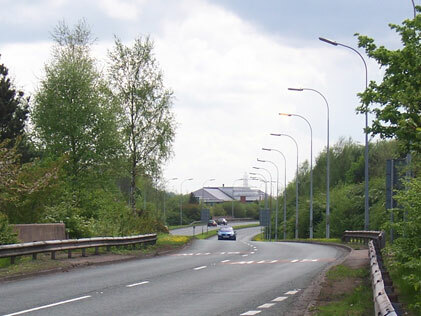 On this section, Birchwood Way crosses the M6. 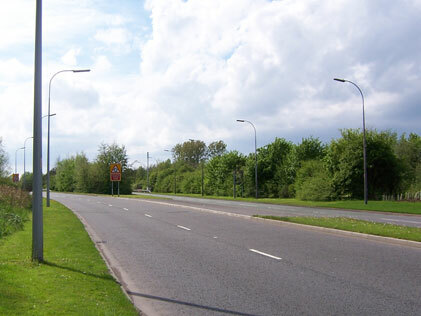 This part was probably dualled so early on because it is one of only two crossings of the motorway that connect Birchwood with Warrington. 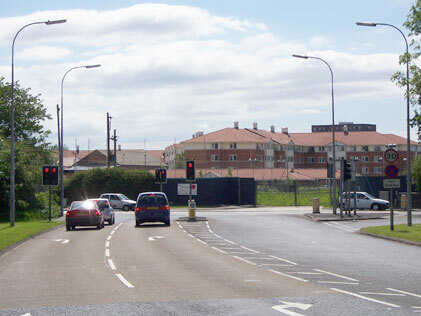 Facing the opposite way, the carriageways immediately flare out again for College Place roundabout. 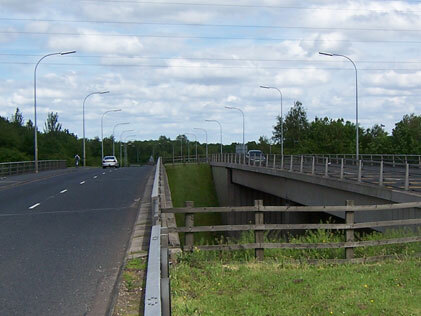 The bridges carrying the expressway were rebuilt when the M6 was widened in the early 1990s and the original line, which presumably left space for future grade-separation, was obliterated. It's hard to see how a flyover might fit in here now. 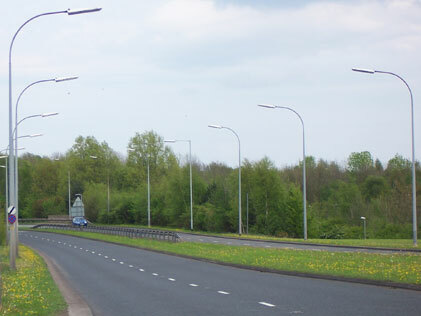 At College Place roundabout, the B5210 is to our left, running parallel to the M6 and providing access to large industrial and residential zones. 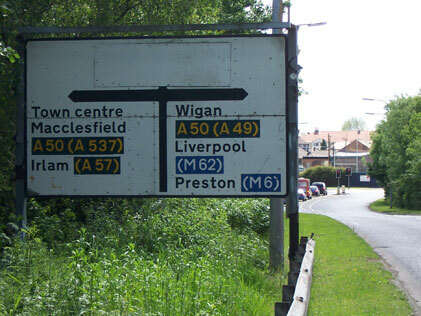 The direction sign here is original to the New Town development and has its signature boxy construction. Beyond, Birchwood Way climbs back up to join the non-existant flyover. Looking at Birchwood Way approaching the roundabout from the other side, the road is single-carriageway and approaches along what would have been the westbound on-slip. Eastbound traffic does this almighty swerve to reach the roundabout, and at the Give Way line motorists are usually looking out of the rear windows of the car to see what's coming. Another look at the strange approach to the roundabout - the curve is enormous and quite disorienting. Along the next section we're back to single carriageway again. 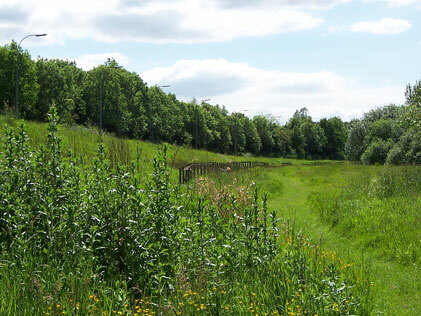 This view looks west along the line of the road - Birchwood Way is on top of the embankment to our left. 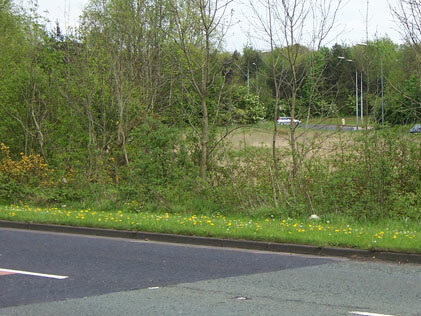 There's a huge area of empty land for the unbuilt dual carriageway and eastbound sliproad. Another mile on, our last calling point is Padgate roundabout. Again Birchwood Way drops quite suddenly to meet it and climbs away again at the other side. 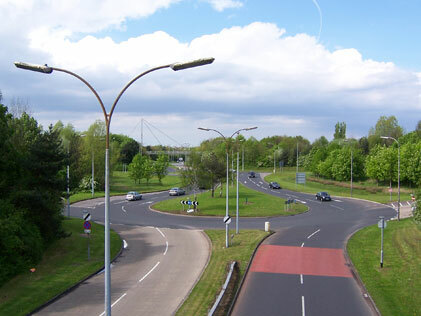 It's one roundabout of a dumbbell junction, with a large space to the north for the flyover, sliproads and twin roundabout. Beyond, we're back on the embankment again and deep in some planned wilderness. 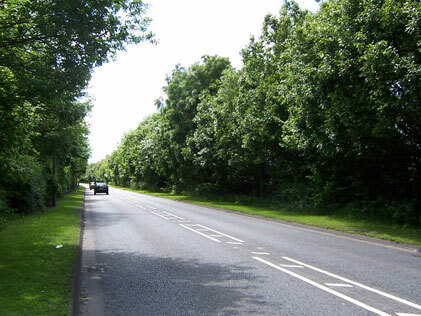 There is space to the right for another carriageway but today it would require some tree-felling. Note also the centre line hatching - it's all the way along the single carriageway sections to discourage overtaking on what should be a fast road. The best part of a mile on, and we're where the next junction should be - a free-flowing triangular interchange with the north-south expressway that was planned but never built. 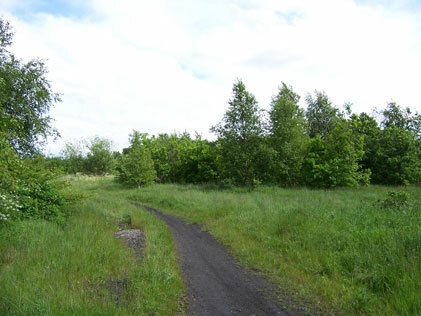 This wasteland is still reserved for that purpose today, but beyond the trees lies a large 1950s housing estate that was too difficult to remove. 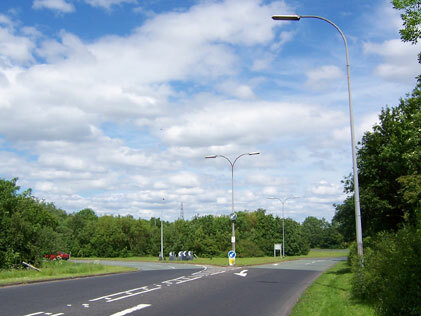 Instead, Birchwood Way turns a corner and suddenly comes to a screaming halt on the A50. Note the blanking panel at the top of the sign - perhaps there was a plan to continue the road through this junction and then grade-separate it later. It's impossible to tell what is underneath. The traffic lights at the end. When they were installed in the 1980s they were a temporary terminus but today they're permanent and a left turn here is the way to the town centre. 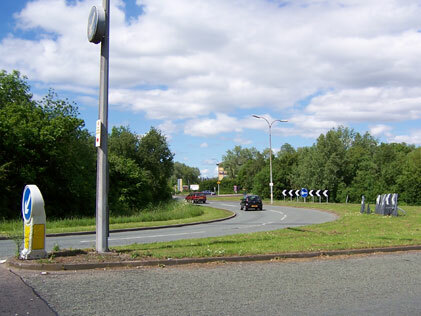 Warrington Borough Council now has plans to dual Birchwood Way (though it's doubtful that they'll build any of the flyovers) - I dread to think how this junction might cope with a dual carriageway stopping here. A look through the gate over the road and here's the reserved land for Birchwood Way to continue west, through Orford Park and to the New Town district of Westbrook. It is still protected against development in case the plan gets resurrected.